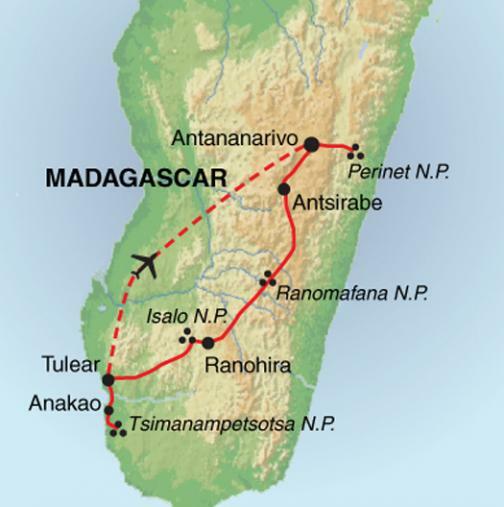 Highlights of Madagascar – The Great Canadian Travel Co. 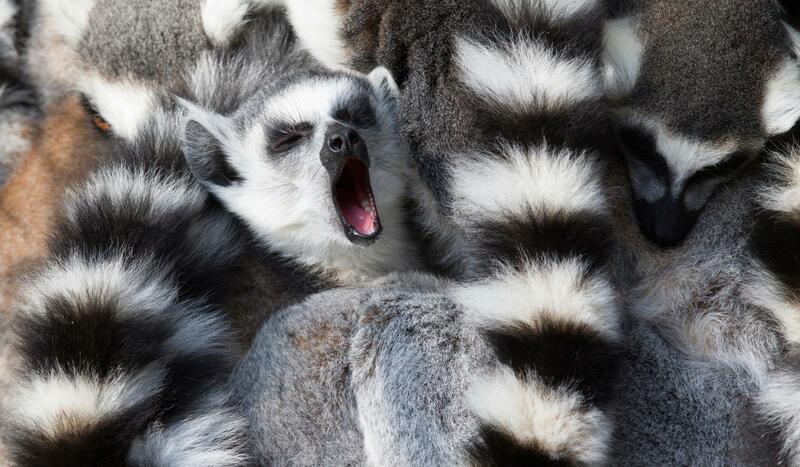 Discover Madagascar’s unique wildlife and stunning beaches. It is a paradise for wildlife lovers, and much of its animal life cannot be found anywhere else in the world. The chief attraction is the lemurs. There are no included activities today so you are free to arrive at any time. This evening’s welcome briefing is the perfect opportunity to meet your guide and get to know your fellow travellers. This morning you will be driven to Andasibe through the green and luxuriant vegetation of the east. This first step brings the group to the humid part of the country with many primary forests and lakes. Along the way you will see Merina villages in the rocky mountains. Arrive in Andasibe around 3pm and the rest of the afternoon is free to relax. In the early evening you will take a twilight/nocturnal walk along the road, close to the Andasibe Nature Reserve, looking out for the nocturnal species of lemur as the torchlights pass their eyes. Discover Andasibe National Park (also known as Perinet) and its wildlife on a 4 hour walk. 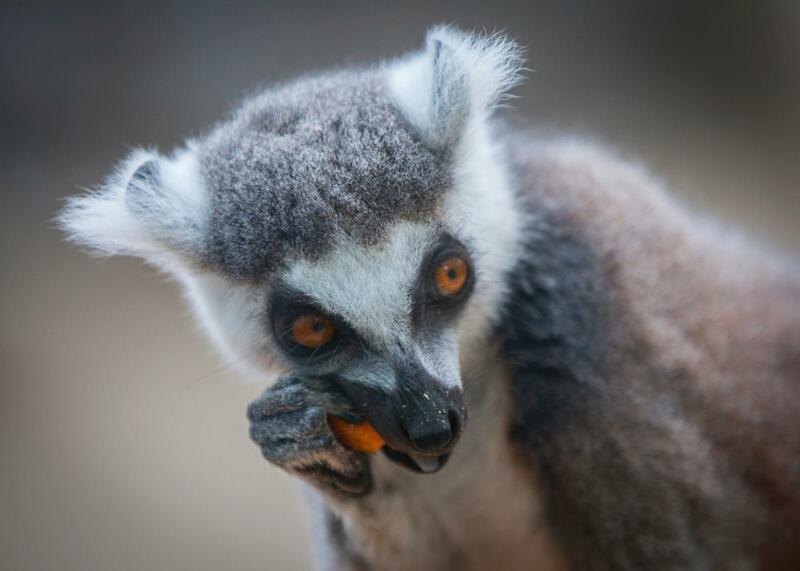 The park is home to the teddy bear-like Indri, the largest of Madagascar’s lemur species, as well as other forms of flora and fauna and a wide array of bird life. Listening to the piercing yet melancholy cry of the Indri in the morning is an evocative sound and for those who are prepared to follow them through the thick rainforest, the reward is often a close-up view of these beautiful creatures. A group of five Diademed sifaka have recently been re-introduced to Andasibe from Mantadia, and if you are lucky, you may spot one of these unusual creatures. In the afternoon you will visit the Vondron’olona Miaro Mitia Ala Reserve. This is a community run reserve where you are able to see several species of lemurs and birds. The reserve is an untouched paradise for endemic animals and plants. There are groups of Indris which we hope to see here in their natural habitat, and their white-headed relatives, the Diademed sifakas, jump between the tree tops. For reptiles and amphibian lovers, the reserve offers countless frogs along its crystal clear river and several amazing chameleons can be found in the forest. You will be driven back to Tana, and head south to Antsirabe, across the highland landscape with its beautiful rice fields on stage. The spectacular eroded hills called ‘lavaka’ could remind you of the Far East with its rice fields and green landscape with vegetables and fruit trees. On the way you will visit the Peyeiras centre in Mandraka which houses an outstanding collection of butterflies, chameleons and frogs. Antsirabe, or ‘the place of salt’, is an elegant city well known as the centre of the beer industry and you can smell the Star Brewery as you enter the town. Founded by the Norwegians in 1856, it is the only place which really feels and looks like a European city. It has a temperate climate and all fruits and vegetable, which grow in cold climates, are found in Antsirabe. After breakfast you will be driven to Ambositra, the centre of Madagascar’s wood carving industry. You are still in the highlands, which are characterized by their architecture: the houses are made with ornately carved wooden balconies and shutters with bright colours. Further on you pass the ‘le col de tapia’, a type of tree, which is resistant to the bush fires of the area. The landscape is still dominated by rice fields on stage, pine forests and eucalyptus trees and rocky mountains. 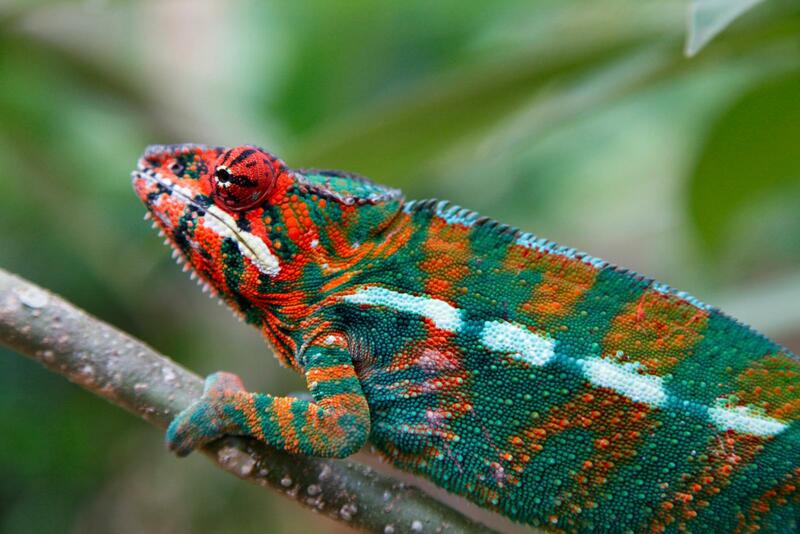 Your destination for the day: Ranomafana National Park. Parc National de Ranomafana (approximately 40,000ha), with its rain forested hills and abundant wildlife, has long been considered one of Madagascar’s highlights, and is one of the most heavily visited of the country’s national parks. Its entrance lies about 7km from Ranomafana village. Altitudes in the park range from 800m to 1200m. In addition to its densely forested hills, Ranomafana’s terrain is characterised by numerous small streams, which plummet down to the beautiful Namorona River. Although much of the region has been logged, the easternmost part of the park retains relatively large areas of primary forest. You will go for a walk in the national park for approximately five hours in the hopes of spotting some of the lemurs, chameleons and other animals found here. There is hope to see Golden bamboo lemurs who are unique to this park, as well as other lemurs such as the Eastern woolly lemur, the Red bellied lemur, the Grey bamboo lemur, and the Red-fronted brown lemur. This park is also home to other mammals including tenrecs, bats and some of the carnivores such as mongoose and the Malagasy striped civet. An early start as you leave Ranomafana National Park behind. The scenery changes dramatically as you head to the small town of Ranohira, a journey of approximately 9 hours. You will stop near Ambalavao to visit Anja National Park along the way – a small reserve where several families of Ring-tailed lemurs can be seen amongst the vegetation. 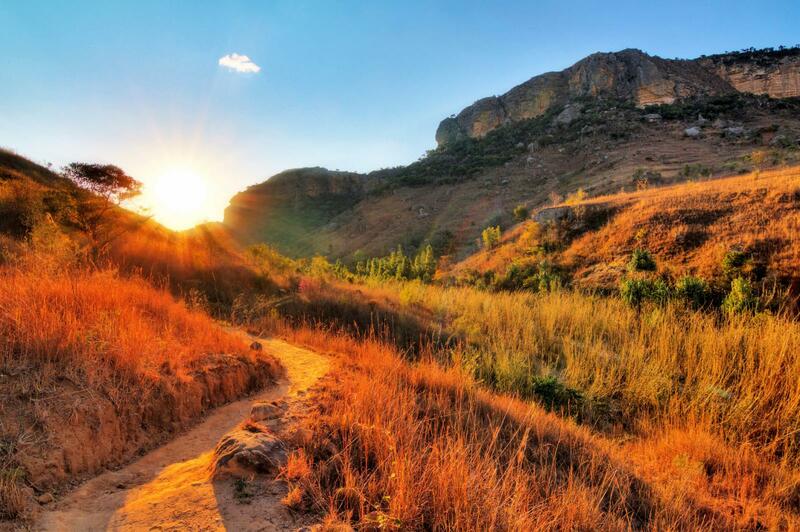 After an early start, you spend your day exploring Isalo National Park. Isalo is a vast region of wind-polished and water-scoured rock towers, deep canyons, gorges and oases often described as Eden. 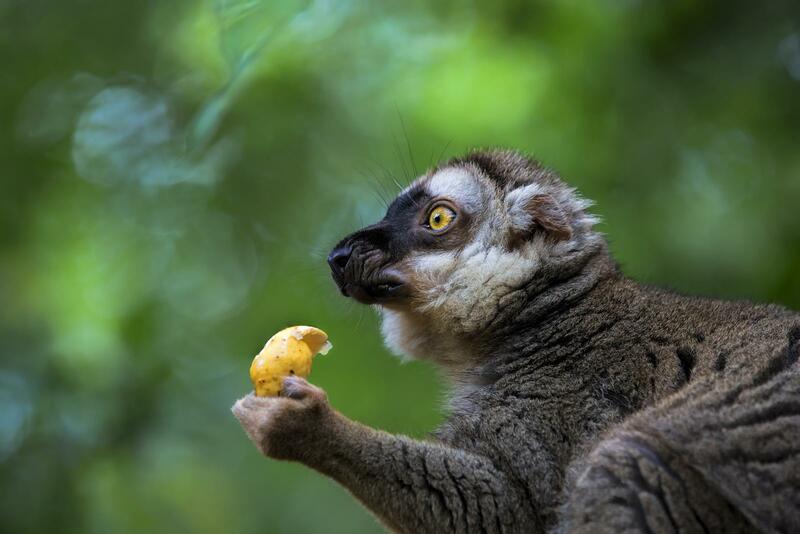 You will go walking in the magnificent Canyon des Makis in search of cheeky Ring-tailed lemurs and the Verreaux Sifaka. You will also visit the ‘Piscine Naturelle’ (natural swimming pool), a beautifully lush spot in such an arid landscape where you can swim and relax. Perhaps the magic is just to soak up the sheer beauty of the park, the combination of coloured eroded rock formations, strange plants and enveloping silence make this one of the most captivating places in Madagascar. After breakfast, you continue to Tulear. This brings you new scenery, among the dry forests of the west and the spiny desert of the south. On the way admire the different ‘Mahafaly tombs and the ‘Antandroy tombs’ from the road and visit Zombitse National Park for a few hours. The Zombitse National Park forest is of particular interest to birdwatchers, as it is home to one of Madagascar’s rarest endemics, Appert’s greenbul, as well as other species such as Giant coua, Crested ibis and Cuckoo roller. 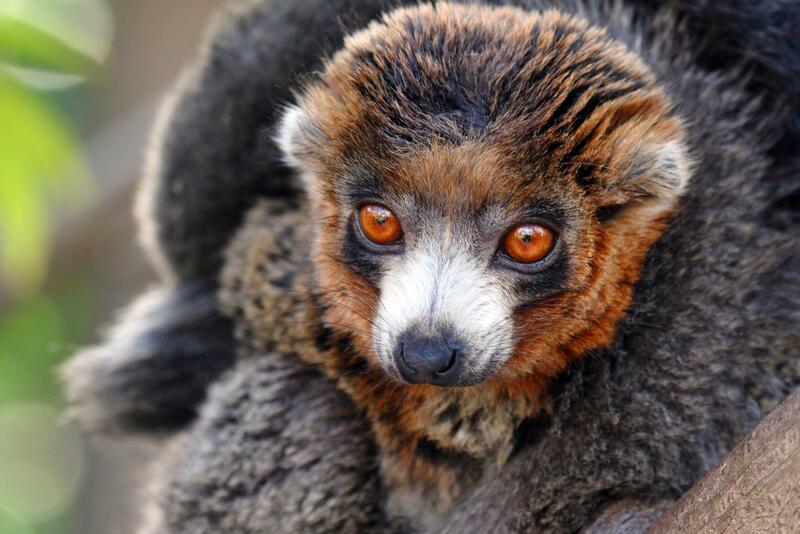 Verreaux’s Sifakas, Red-fronted Brown lemurs and Sportive lemurs are also seen here. This morning you take a boat transfer to Anakao arriving at around 9.00 am. 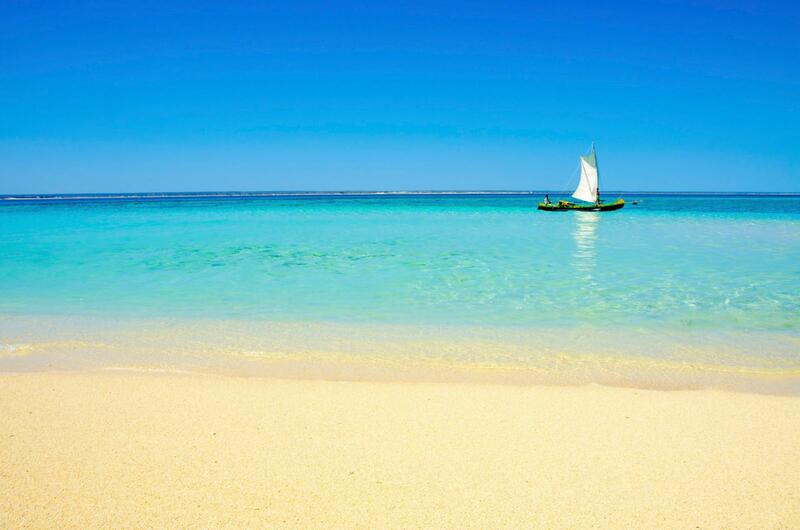 This Vezo (meaning ‘the people who fish’) fishing village lies on the south west coast of Madagascar and boasts white sandy beaches.The rest of the day is free for optional activities, including snorkelling, diving, pirogue (small boat similar to a canoe) excursions, swimming and more. An early 4×4 transfer of approximately two hours takes you to Tsimanampetsotse for a full day visit of the national park. The large, shallow soda lake is the focus for this terrific 43,200ha national park. The large limestone plateau here has some of the most striking spiny forest vegetation in Madagascar with countless endemic species. The park sits on a large underground aquifer that runs north, evidenced by the numerous sinkholes and caves. The lake is renowned for its waterfowl, notably flamingoes and other rare endemic birds including the Madagascar plover. You may even be lucky and spot the emblem of the park, the very rare Grandidier’s mongoose! In the afternoon you return to Anakao. Today you take a boat excursion to Nosy Ve to see the world’s most southernmost all-year breeding colony of Red-tailed tropic birds, stunning all-white seabirds with red bills and long, thin, red tails, nesting in this small island. If you are lucky you may see the females roosting under small shrubs, well hidden from any airborne predators such as hawks or eagles. A stroll around Nosy Ve’s shoreline including a long white sand beach takes about one hour. After your exploration we will return to Anakao, usually around lunchtime. The rest of the afternoon is free for optional activities. Today you transfer to Tulear airport for your flight to Antananarivo. Depending on the flight schedule, you may have some time in the afternoon free to explore Antananarivo on your own. This morning you will embark on a city tour of Tana, the picturesque capital of Madagascar. With its bustling markets, friendly people and ancient town on a hill with freestone churches and ancient royal places, it is unique among the world’s other capitals. You will visit Ambohimanga, the fortified village and its Royal palace. Ambohimanga, otherwise known as Blue Hills, was for a long time forbidden to Europeans. The kings and queens returned here for rest and relaxation on top the forested slopes of this hill-top village. From here began the line of kings and queens who united Madagascar into one country. Ambohimanga still remains of spiritual significance for the Malagasy people with ceremonies and rituals still taking place. Your adventure ends this afternoon after a city tour. This is a leisurely tour; if you are healthy, enjoy the outdoors and want a relaxing trip, no experience is required.